Artwork asks: Is capitalism working for you? Art project asks: Is capitalism working for you? How’s capitalism working for you? That’s the question a new interactive art installation will ask passersby in New York City’s Times Square, October 6-9. 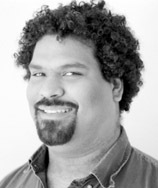 Sponsored by United for a Fair Economy (UFE), a national think tank concerned with issues of income inequality, the project is the brainchild of artist Steve Lambert. The presentation is part of the 2013 Crossing The Line Festival in conjunction with the Times Square Arts project. 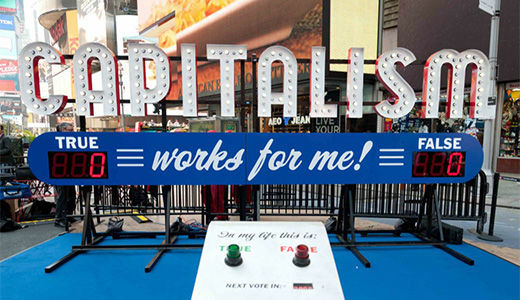 The installation consists of a giant glitzy display stating “Capitalism works for me” with an electronic counter labeled “true” and “false.” Participants are encouraged to think about the issue, vote one way or the other, and to discuss their answer. Volunteers will be on hand to encourage participation and to discuss issues of income inequality. The project coincides with recent new data on the growing gap between rich and poor and the ongoing GOP-initiated government shutdown. The display will run from noon to 7:00 p.m. Sunday through Wednesday, October 6-9, 2013 in the heart of Times Square.